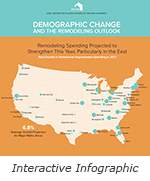 CAMBRIDGE, MA – Homeowner spending on remodeling is expected to see healthy growth through 2025, according toDemographic Change and the Remodeling Outlook, the latest biennial report in the Improving America’s Housing series released today by the Harvard Joint Center for Housing Studies. Demographically based projections suggest that older owners will account for the majority of spending gains over the coming years as they adapt their homes to changing accessibility needs. Although slower to move into homeownership than previous generations, millennials are poised to enter the remodeling market in greater force, buying up older, more affordable homes in need of renovations. The residential remodeling market includes spending on improvements and repairs by both homeowners and rental property owners, and reached an all-time high of $340 billion in 2015, surpassing the prior peak in 2007. [See Interactive Infographic below.] Spending by owners on improvements is expected to increase 2.0 percent per year on average through 2025 after adjusting for inflation, just below the pace of growth posted over the past two decades, and about on par with expected growth in the broader economy. The large baby boom generation has led home improvement spending for the past twenty years, and its influence shows no signs of waning. Older homeowners will continue to dominate the remodeling market, as they make investments to age in place safely and comfortably. Expenditures by homeowners age 55 and over are expected to grow by nearly 33 percent by 2025, accounting for more than three-quarters of total gains over the decade. The share of market spending by homeowners age 55 and over is projected to reach 56 percent by 2025, up from only 31 percent in 2005. Gen-Xers are now in their prime remodeling years, and while some are still recovering from home equity losses after the housing crash, many in this generation will undertake discretionary projects deferred during the downturn. And as younger households move into homeownership, they will supplement the already thriving improvement market. “With national house prices rising sufficiently to help owners rebuild home equity lost during the downturn, and with both household incomes and existing home sales on the rise, we expect to see continued growth in the home improvement market,” says Kermit Baker, director of the Remodeling Futures Program at the Joint Center for Housing Studies. Even though increasing house prices are encouraging homeowners to reinvest in their homes, they also are raising housing affordability concerns among younger buyers. Climbing mortgage interest rates and rising house prices not only make homeownership more difficult for younger households, but leave those who are able to buy with fewer resources to make improvements and repairs. And while high rents may provide an incentive to buy homes, they also make it difficult for first-time buyers to save for a downpayment. 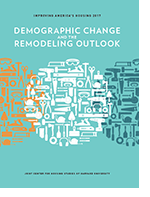 Some demographic trends are also presenting challenges to a healthier remodeling market outlook. A disproportionate share of growth over the coming decade will be among older owners, minority owners, and households without young children; groups that traditionally spend less on home improvements. Finally, as a new generation of homeowners enters the remodeling market, specialty niches focused on energy-efficiency, environmental sustainability, and healthy homes are likely to see significant growth. Home automation—encompassing everything from entertainment systems to home energy management, lighting, appliance control, and security—is also emerging as a strong growth market, particularly among younger households. Looking ahead, there are several opportunities for further growth in the remodeling industry. The retiring baby boom generation is already boosting demand for accessibility improvements that will enable owners to remain safely in their homes as they age. Additionally, growing environmental awareness holds out promise that sustainable home improvements and energy-efficienct upgrades will continue to be among the fastest growing market segments.